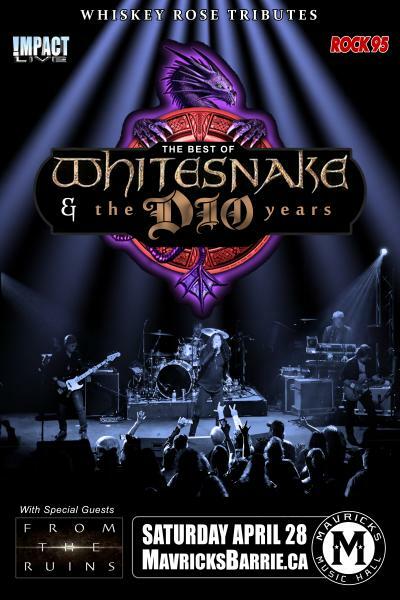 WRTributes: WHITESNAKE & The DIO Years! $17.70+HST Advance, More At The Door! ROCK 95, WHISKEY ROSE TRIBUTES & IMPACT LIVE! "WRT is quite possibly one of the biggest names in the Tribute scene. They hand pick some of the best music to perform live. There's flash & costumes. Good tributes try to completely bring you the experience of being live at the original's shows. Then there’s the music - Let me tell you that the music is spot on - you get the exact same experience! WRT is best known for the performance that started the entire ball rolling. Their Whitesnake & Ronnie James DIO/Black Sabath tribute brings the crowds every time! WRT is one of the most masterfully crafted live performances seen to date"